﻿ How to Wow Your Prospects on Your Website and in The Inbox » Red Mango Marketing! Are you someone he or she can trust? Do you have a quality product or service? Will he or she benefit from doing business with you? Because of the prehistoric survival mechanisms in humans, your prospect has made a major decision on whether or not to do business with your company in just seven seconds. In this day and age, digital communications often take the place of the old-time meet and greet. Instead of saying, “Hello,” you have a pop-up on your website; instead of a handshake, you send an email. To save an invaluable amount of time, you can even automate many of these processes. Read along, as we explore how to wow your prospects on your website and in their inbox. There are over 60 trillion web pages indexed on Google with over 2.3 million searches per second. With all of that content at your prospect’s fingertips, you need to engage and capture your prospect within seconds of them hitting your website. A simple way to wow your prospects and grow your email list is through Privy, a website solution that offers popups, banners, email bars, and mobile-friendly subscription forms to help you automatically grow your email list. At BJC Branding, we’re huge fans of Privy, integrating it with the majority of our clients’ Constant Contact accounts. As a result, our clients have experienced outstanding email list growth. To learn more about Privy and how organizations like yours are using it, take a look at our previous blog post. Once your website visitors join your email list, it’s time to lay on the inbox charm with a real-time Welcome Email. Tip: Here’s how to customize your Welcome Email in your Constant Contact account. The key to the real-time Welcome Email is the instant gratification experienced by your subscribers. They sign up on your site, and they instantly receive a greeting in their inbox. It’s professional, punctual, and, best of all, automated. You can’t just send any run of the mill message as your Welcome Email. It’s important to put some thought into your campaign (both from a design and content perspective) to really wow your new subscriber. Following our BJC Branding example, below is the Welcome Email subscribers receive when they sign up through our Privy website form. Our Welcome Email is extremely effective because it welcomes our new subscribers to the list and engages them with an informal request to reply to our email. A lot of thought went into the written content (we’ll cover that in a future blog post) so we are keeping it hidden. 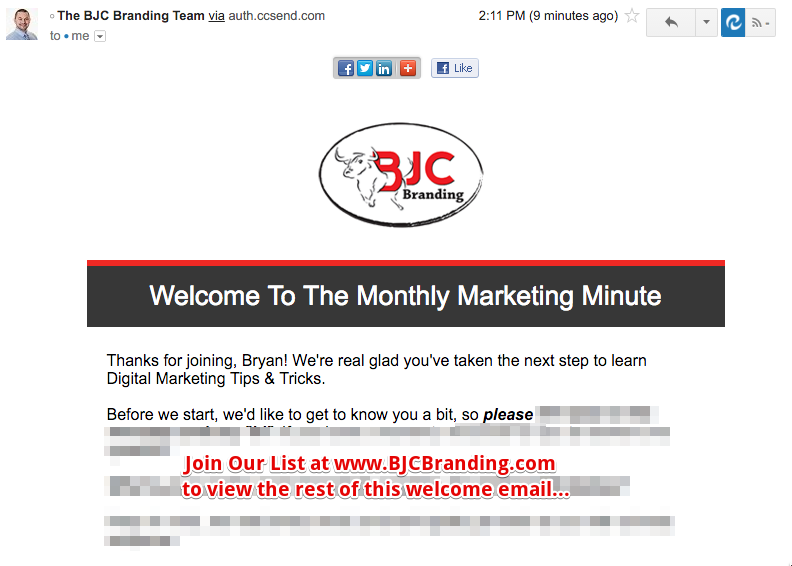 Not to fret, you can see our entire Welcome Email (and even use our content) by subscribing to our mailing list at www.BJCBranding.com. Keep up the wow factor. Hopefully, you now know how to wow your prospect and make a long-lasting, positive first impression. Want more email marketing tips and tricks? Join our email list at www.BJCBranding.com. 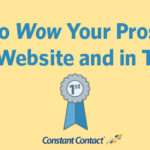 The post How to Wow Your Prospects on Your Website and in The Inbox appeared first on Constant Contact Blogs. This entry was posted on Monday, June 20th, 2016 at 9:30 am	and is filed under Automation, autoresponder, Email Marketing, List Growth, News & Updates, welcome email. You can follow any responses to this entry through the RSS 2.0 feed. Both comments and pings are currently closed.